The closing date is approaching fast, and you’re not ready! This isn’t going to be an easy move as it is, let alone if you aren’t prepared. It’s not like you’re just moving across town, and you’re dreading the headache and hassle the move could cause you. However, your new job a few states away was too good to pass up, and the family is ready for a new adventure anyway. In the rush, though, it’s easy to let anxiety get in the way and cloud your thinking. You’ll be stressed enough with the new job, so make it easy on yourself for the actual move. Avoid these mistakes while preparing to move and it will be much less stressful for yourself, your family, and anyone who’s kind enough to help. 1. Putting it All off until the Last Minute. When you procrastinate with all of the packing and preparation, you’re unnecessarily opening yourself up to frustration that can be easily avoided. You’ve known for a while you’re moving, and even if you don’t know exactly when or have a place to go to doesn’t mean you have to wait until the final few days to pack things up. Take your time and pack up rooms little by little, leaving only the necessities for the last week. If you’re going to need to rent a truck, as soon as you find out when you’ll need it, book it. Particularly over holiday weekends (which are perfect for interstate moves), trucks get booked fast. Even better, finding an interstate moving company to handle everything is an excellent way to reduce stress. Hiring a full-service mover means you get much more than just a truck; you also get the assistance of experienced professional movers. 2. Lacking the Necessary Materials with no way to get more. Once you get packing, it’s almost inevitable you’ll run out of boxes or newspaper or whatever else you might need to pack up your stuff. By starting early, you’ll notice ahead of the deadline what you’re missing and you can start to make up the difference. You might know someone who has moved recently; if so, ask them for any boxes they have that are still useful. If you work for a company with an IT department, ask for computer boxes – they usually have handles and are designed for holding heavy things. 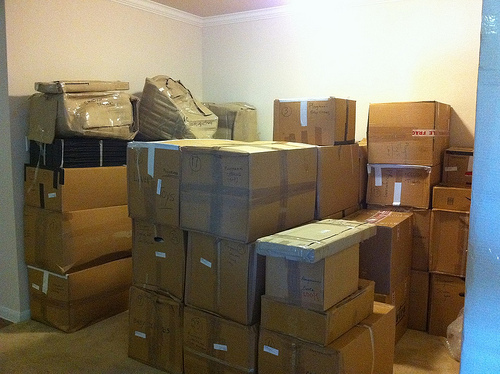 If you’re still in search of boxes, you can simply buy them at an affordable rate from your moving company. You can find good interstate moving companies by checking reviews and asking around. 3. Forgetting where you put your Stuff. This mistake to avoid is more for when you finally arrive at your new home. So many people forget how useful it is to know exactly where each box they remove from a truck should go. Most people put the room name on the outside, and that helps get organized at least somewhat. Unless you want to unpack everything, though, it’s a good idea to catalog what you’ve packed. That way you’ll be able to tell where that one thing you needed from amongst the 10 boxes you packed for your kitchen. Moving always feels extra stressful, but with a small plan, things will come together quickly and efficiently. Before you know it, it will all be over and you’ll be enjoying your new home as if you’ve always lived there.